I’m just writing as a resident of Aveley because I’m concerned about the latest UKIP leaflet that came through our door. 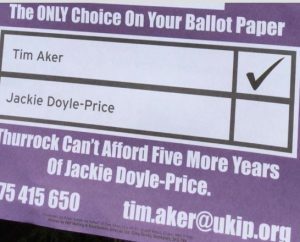 In it, the candidate, Tim Aker, implies that the only choice in Thurrock is between himself and Jackie Doyle-Price. I think there is a danger that some residents will see this and think Labour aren’t even standing. 68 Responses to "Letter to Editor: “Is Thurrock UKIP election leaflet misleading voters?”"